I got the strangest email from Redbox over the weekend. I actually thought it was a delayed April Fools message. Basically it was announcing “EcoATM.” No it is not a new form of an ATM machine, it is a kiosk that allows you to sell your old cell phone back. Complete with videos that show how you are given a sticker, have to put your driver’s license into the machine (and hope it does not get stuck), place the sticker on the back of the phone and they will proceed to send in your phone and confirm the amount you get paid. If you want, you can allow the proceeds of your phone go to the charity of your choice. Why does it seem so strange to me? 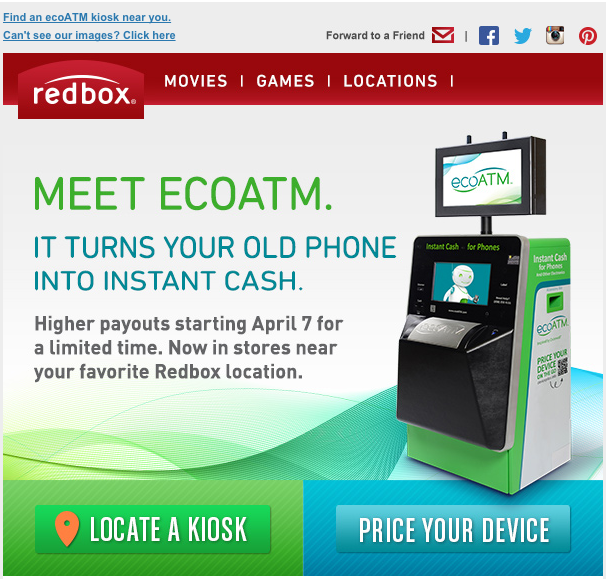 Sure, I am grateful that it is another way for folks to be paid in hopes that their phone does not end up in a landfill, but would you go to a kiosk and submit your phone (while also returning your Redbox movies at the neighbor kiosk). It just seems very unlikely. It feels rather cheesy actually. It looks like all the local kiosks are in very strange suburbs. Ones that are not on the normal beaten path, almost as though they have purposely launched in obscure locations. You can even “price your device” by selecting your model and phone provider and they will let you know the range of what you can expect to receive back. I still think it is odd. Maybe because Chris and I have found that we can make so much more selling our old phones on eBay. I am not sure if the “sell your phone” kiosk is a sustainable business model. I suppose we go through phones much faster than we used to. So if they can cover picking up phones and clean up of kiosks, and then sell them for 50% more, then maybe it is sustainable. I guess we have gone from kiosk movies, to coin exchange, to selling phones. What is next?